Bringing you the best ever Video Editor app with functions like Photo Video Maker With Music, Video Effects Editor, Slow Motion, Fast Motion, Trim Video Audio Video Merger and Audio Extract. Add Text to Video along with stickers, Effects and more. 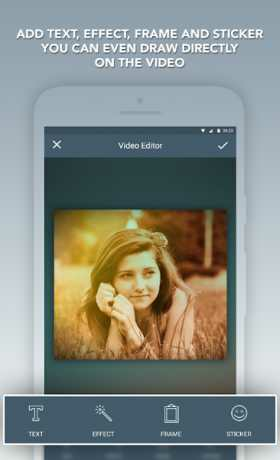 Make your Video interesting with this Video Editor or Video Effects Editor App. 1. Video Effects Editor :- Video Effects Editor or Video Editor function allows you to add Text to Video along with effects, stickers and more. This Video Editor feature makes your video a lot more interesting. 2. Video Slideshow Maker or Photo Video Maker With Music :- Video Slideshow Maker or Photo Video Maker With Music helps you convert your photos into a slideshow video and add music and effects to it. Being user friendly, Video Slideshow Maker or Photo Video Maker With Music is a simple tool to create and share your photos in a video format with your loved ones. 3. Slow Motion :- Play your video in Slow Motion via this feature. 4. Fast Motion :- Play your video in Fast Motion via this feature. 5. Trim Video :- If you have been wanting to trim your video to be able to share it with easy and this Trim Video feature is surely meant for you. 6. Audio Video Merger :- Have you ever wanted to add a different Audio to your video? This Audio Video Merger allows you to add different Audio to your video. 7. Audio Extract :- Audio Extract allows you to Extract Audio from a video and be able to share the audio file.